On Mar. 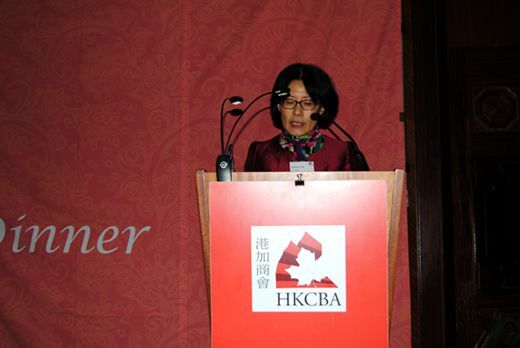 8, Consul General TONG Xiaoling attended the Hong Kong-Canada Business Association (HKCBA) Annual Spring Gala. In her speech, Consul General TONG appreciated HKCBA’s pioneering role in expanding commercial relationship between Canada and Mainland China via Hong Kong in the past decades. TONG said，Hong Kong has long served as a key bridge linking China’s Mainland and the rest of the world, making tremendous contributions to China’s opening up and economic development. Hong Kong will continue to play an important role in the“Belt and Road Initiative”and the Greater Bay Area Project. Therefore we have confidence in the continuous relevance of HKCBA in the new era of development in greater China. TONG also quoted President Xi Jinping’s statement that “China will not close its door to the world. We will only become more and more open”. China used to be a “World Factory”, and nowadays has become a “World Market”. Starting from this year, China will hold International Import Expo in Shanghai, which will provide new opportunities for countries/enterprises to expand export to the huge Chinese market. Canadian businesses are welcome to participate in the Expo.